This is the most exciting, provocative and readily understandable discussion of monotheism in its various aspects that I have seen. 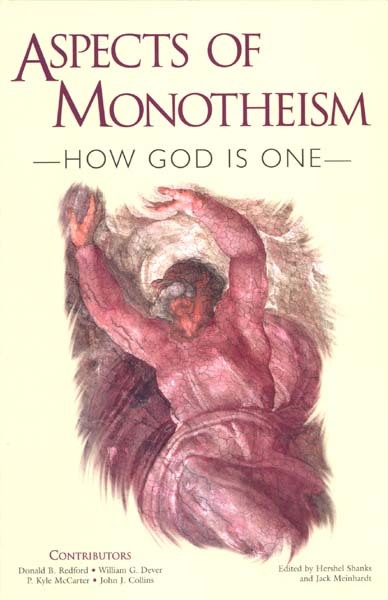 Stemming from a symposium at the Smithsonian Institution in Washington, D.C., organized by the Biblical Archaeology Society, Aspects of Monotheism: How God Is One presents the rich and variegated views of four distinguished scholars on different facets of what is a rich and variegated conceptthe idea of one universal God. Perhaps some of the excitement is a result of the sensitivity of the subject. Were the ancient Israelites really the first to worship a single god, or did the Egyptians beat them to the punch? And were the ancient Israelites really monotheists, or was the idea of a single, universal God a late development in Israelite history? What can archaeology tell us about the subject? Is it possible that the Israelite god Yahweh had a female consort? Did popular religion in ancient Israel depart from the monotheistic strictures in the Hebrew Bible? And what of Christianity? How are we to understand the divinity of Jesus, alongside his Father? Even more difficult, how are we to understand the Trinity? The presentations in this book tackle these questions forthrightly and provide some surprising answers. Despite the complex, even philosophical, nature of the subject and the breadth of concrete scholarly materials that bear on it, the authors write in language that is perfectly accessible to the layperson. For that reason, I predict that this book will become standard fare in college courses and adult discussion groups. It will provide the basis for innumerable stimulating conversations. I envy the reader confronting this material for the first time.